Warning: this post is heavy on travel tales, and short on pictures. If you mainly enjoy looking through the pretty pictures on this blog, you may want to scroll down to the next post. 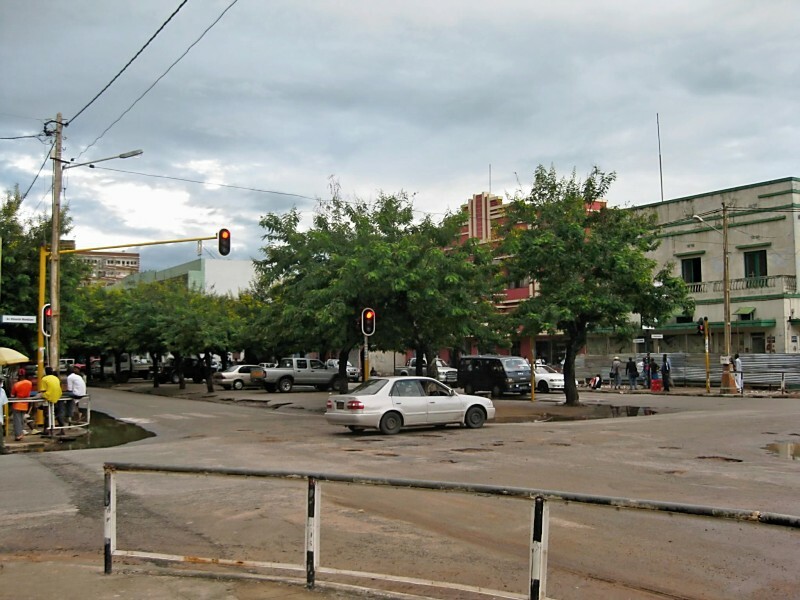 First, we would get from the beach to Nampula, the big city in the northern part of the country. 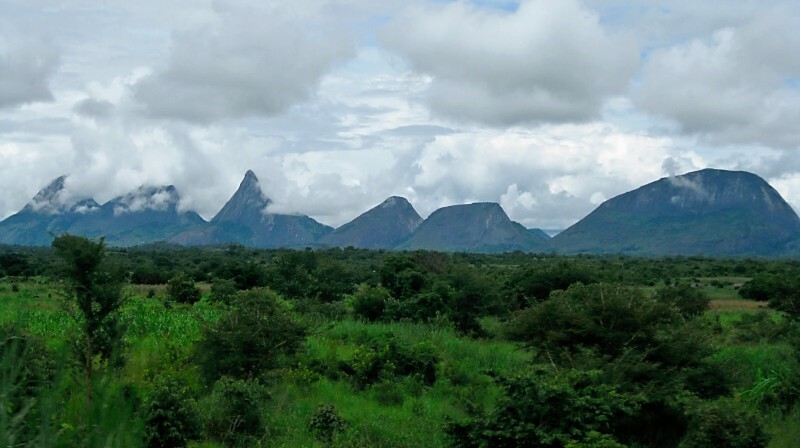 Second, we would take the train from Nampula to Cuamba, a small city near the Malawian frontier. Third, we would hop on a bus the remaining distance to the Malawi border. You always hear that travel in Northern Mozambique–particularly during the rainy season–is as rough as it is anywhere, but this sounds pretty straightforward, right? Our first task was to walk from the beach hut to the small town of Chocas, where we had loaded up on supplies a couple days before. We had previously learned that “chapas” (the Mozambican term for basic transport vehicle, which can describe anything from a proper minibus to, apparently, a small pickup truck) depart the town at 5AM and 7AM. Realizing that we had a long hike along the beach with our packs beforehand, we opted to take the later chapa. After getting packed up and ready to go in the dark (no electricity that night) we set off. Walking on a beach is a nice feeling when you are carefree and have nowhere in particular to go, but when you are walking miles with a heavy load it is extremely difficult, and the hike took well over an hour. We arrived at the market at three minutes to seven, and, sure enough, a small pickup truck soon showed up. We shared the back of the truck with other people and goods–the truck was filled with cement blocks, food, empty Coke bottles, and corregated tin. So we set off down the dirt road to the main highway, from where we would have to find another chapa to take us the rest of the way. The journey started out easy enough: stopping frequently to pick people and goods up, never going very fast–typical issues–until we came across something very unpleasant. First, the other passengers began groaning and shuffling around. Then, we noticed that there were medium-sized flies all over us. At last, looking forward down the road, we realized we were driving through a thick cloud of these things that went on as far as the eye can see! Flies were everywhere. All over the ground, our bags, crawling on our skin, hair, and clothes. We were frantically pulling them off of us but there were so many in the air that it was useless–more would come instantly. We turned to the other passengers and yelled “no peligroso?” (“not dangerous?” in Spanish) and gestured biting. They laughed and said no. So at least they weren’t dangerous, but this went on for miles–probably 15 minutes we were stuck in this thick cloud of insects. Of course, after the cloud eventually died down the bugs were still everywhere. But we learned to live with the bugs, and by the end of the ride we could laugh about it (we still jokingly refer to it as the “plauge of locusts”). Eventually we got to the turnoff on the highway and waited under the thatched bus stop. The purpose of the thatch isn’t to protect from the rain–it’s pretty much useless against that, as water just goes everywhere and turns everything into mud no matter waht you do–but rather as an escape from the ubiquitous African sun, which was already burning strong at 8AM. After only a couple minutes of waiting, a new chapa–this time a significantly larger truck with an open bed–was headed in the direction of Nampula. We first said no–we were already sunburned and were not going to make it worse with two hours on this vehicle–but they were desperate for our business. I stipulated that if Caroline could sit in the cab, we would ride with them. So we set off. I tried to count the people in the back of the truck with me; it was impossible to be accurate but somewhere near 35 people of all ages. I was terrified of falling off so I huddled on top of a bundle of corn in the middle and kept my weight low. I wore my rain jacket as a bonnet to keep out of the sun–when people looked at me oddly I said “quemar” (“to burn” in Spanish) and they seemed to understand. The chapa was not direct to Nampula, it turned out, as we had to switch again in Monapo, a small city in between the Ilha and Nampula. After an very uncomfortable couple hours in a proper minibus (give me a truckbed anyday!) we were finally in Nampula. Once at the bus station, we asked around about any transport headed to Cuamba–it was still before noon, and we thought it might be possible to make it all in one day–and people said we had to take the train which left at 5AM the next day. So we conceded that we would take the train, and spend the night in Nampula. Nampula is not a great city. It doesn’t seem particularly unsafe, but the place just isn’t particularly inviting, with very few tourist services on offer. We could only find one internet cafe, which was government run, and, by our previous experiences with the internet cafes, not worth spending a minute or a cent at. The water at our hotel went out in the evening and never turned back on.The only flicker of enjoyment was eating a nice Portuguese meal at the Sports Club. And off to bed without running water. We set off the to train station at 3:30AM. Although things in Africa can usually not be counted upon to leave promptly, it seems you can never arrive too early for anything. The train to Cuamba theoretically has First, Second, and Third Class seating. Unfortunately, the First Class seating hasn’t run in years. So you have Second and Third Class seating. Our only word of advice for the train was to avoid Third Class at all costs. “More crowded than a chapa,” we heard. When we walk into the train station at about quarter to four, what do we learn? Of course, no Second Class today. No dining car either. We were stuck. 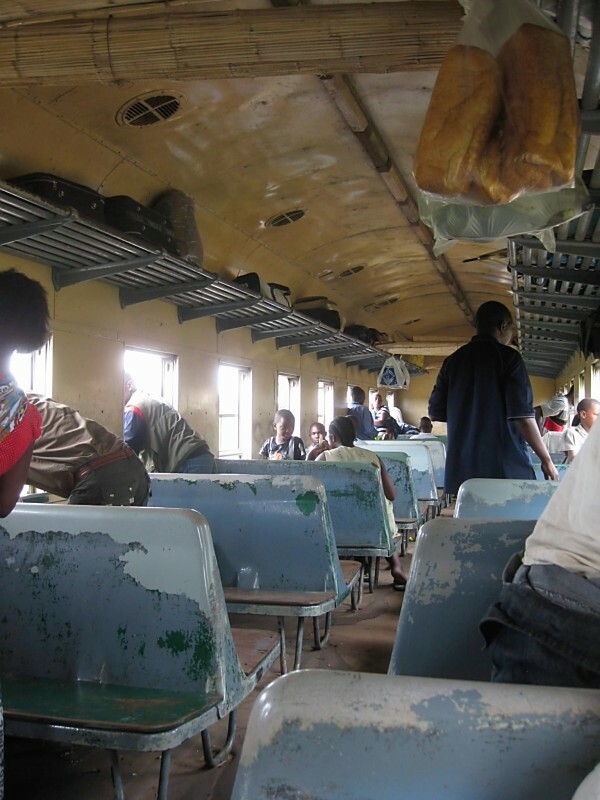 Brave the dreaded Third Class cabin or stay in Nampula another day? Which would mean going back to our hotel without water and trying to go back to sleep, only to repeat the whole 3AM fiasco tomorrow. We made the flash decision to take the Third Class. I mean, how bad can it really be? Of note, the train ride lasts, at the very least, 10 hours (to go a measley 300km or so). We bought our tickets and walked cautiously into the pitch black railcar and found our way to an available seat. Third Class really doesn’t deserve the dreaded reputation it gets, at least not the day we took it. The train never got extremely crowded–usually a seat or two was even available–and we stuck to the basics: never leave the seat, never go to the bathroom, keep your valuables tightly secured, and so on. The worst thing about the train was that the seat was a plank of wood just like a school desk–not so bad for an hour, but a pretty serious pain after ten hours. Above is a picture I was able to snap at a big stop along the way, when everybody gets distracted by the rush of vendors trying to sell things through the window. The big plus on the train is the landscape. 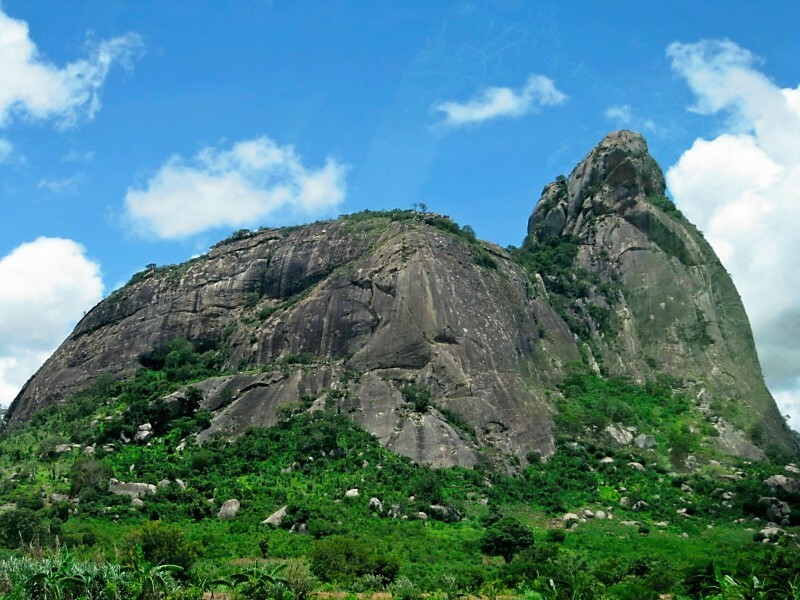 Northern Mozambique is studded with hundreds giant granite domes resembling Stone Mountain. After the tremendously long train ride (which would sometimes stop in the middle of nowhere for as much as half an hour), we arrived in the remote city of Cuamba at about 3:30PM. Surprisingly, we were immediately pounced upon by people trying to get us into their chapa to go straight to the Malawi border! It seemed impossible–in a country where 12 noon was a late bus, a 3:30 departure was unheard of–but apparently plenty of people were headed to the border. But, alas, after a whole day of not using the restroom or eating anything besides cookies we got from the market way back in Chocas, a three-hour plus ride to the border, arriving at an unfamiliar border town in the darkness, didn’t seem worth it. We would stay in Cuamba. 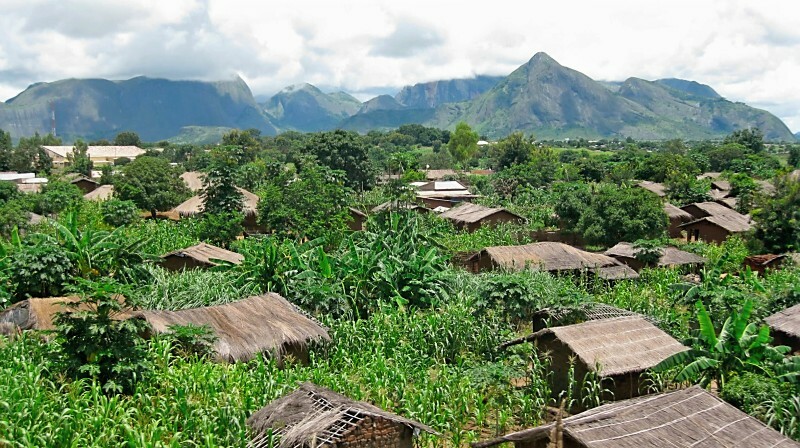 Cuamba was so sparsely populated it was pleasant. In a city without an inch of paved road, it felt like crime and other annoyances were impossible. We had a nice dinner and decided to wake up for the first chapa to the border, which was said to depart at 4AM. After a rainy night, we boarded the minibus and took our seats. We felt that if we could make the border by 8AM we would have a good shot at making it to Lilongwe that day. Unfortunately, the bus had no intention of departing at four. This was simply the time they began collecting passengers, which involved repeatedly touring the small city checking every pensao for passangers headed to Malawi or the remote north of Mozambique. After two and a half hours of riding around on Cuamba’s horrible, bumpy streets–we were already completely jaded from being crammed on the bus so long–we finally departed. The dirt road to the border was a horror. The rain from the night before had left it potholed and rutted. 30km/h was smooth sailing, and we were packed very tightly. Caroline had an especially unfortunate position, in the back corner of the minibus over the wheelwell. The areas we passed through were incredible. Towns with no sign of modernity besides perhaps a wayward shipping container. Huge numbers of people walking along the road, with the minibus always honking to alert them to make way. We passed maybe a dozen vehicles going in the other direction. This portion of the trip was more remote and off the beaten track than I could have imagined. It took so long that we conceded we would not be able to make it to Lilongwe that day, but instead we would spend the night at Monkey Bay, on the shores of Lake Malawi. 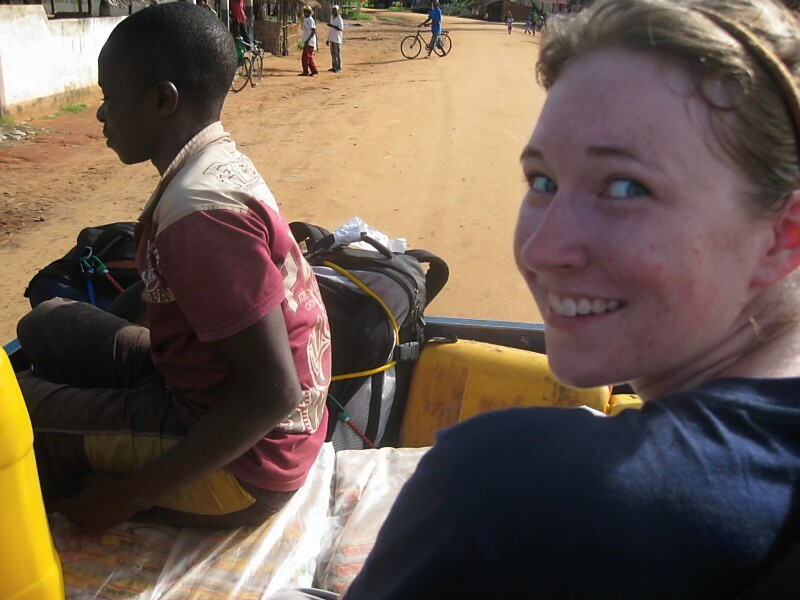 Eventually we were dropped at the border town of Mandimba. It’s always a bit iffy whenever you’re dropped off at a border. But when you’re a white person and you’re some of the only people getting off the bus at that stop (most were continuing on for the long haul to the far north of Mozambique) it is downright chaotic. We were surrounded by people frantically offering us bike taxis and money exchange, both services we were in need of. My strategy in this situation is to pick a trustworthy guy with a decent price and try to get him on your side, so hopefully he can get the others to back off. I was successful in picking an honest money changer. After negotiating the deal in Portuguese (the last I would have to speak! ), I traded my 1150 Meticais for 6050 Kwacha. The exchange rate was actually better than I thought the fair rate was, so that turned out to go reasonably well. The bike taxis were next. We were quoted 50 Meticais ($1.50) was the going rate to the border post, 7km away, which sounded like a fair deal. I told him 100 Maticais for the both of us, and he could choose his friend to take Caroline. So we set off on the bike taxis. The first part of the ride was rather pleasant–we were out in the countryside, kids waving, with scenery going by. We arrived at the Mozambique border post and I tried to pay the bike taxis. They said no, there was still further to go, and I thought that was rather honest of them not to simply take off with the money. The Mozambique border formalities went over fine. We got back on the bikes and started off again. After a moment on the bike, the driver said the next segment would be an additional 1,000 Kawcha ($6), now that we were in Malawi. I told him to stop. I asked him how far, and he said it was 6km farther to the Malawi border post. I confirmed that he said 1,000 for both, and he said yes. Even though I knew there was no good reason the price should double for the second segment of the journey, I begrudgingly accepted and we started. After a while longer on the bike, he said it would actually be an additional 1,000 Kwacha each. Ahh, so we are at the heart of the scam: take the tourists halfway, then quadrouple the price for the second half once you’ve set off and they have no other option. I was furious. I told him no, I’m not paying that, as it was different than what was agreed to. He said I was mistaken. I said no, I’m not paying that much and that was final. He didn’t say anything else. When we finally made it to the Malawi border post and I was thoroughly steamed I handed him 1000 Kwacha and 100 Maticais in a wad and stormed off toward the customs post. I half expected him to take issue with the payment and yell at me, in order to cause a scene in front of the border guard. I knew in this instance I would have no choice but to pay him the outrageous price. But he seemed okay with the total payment–which is probably triple the normal cost for a bicycle taxi ride of that length–and we went through to the Malawi side and freed ourselves of the whole situation. 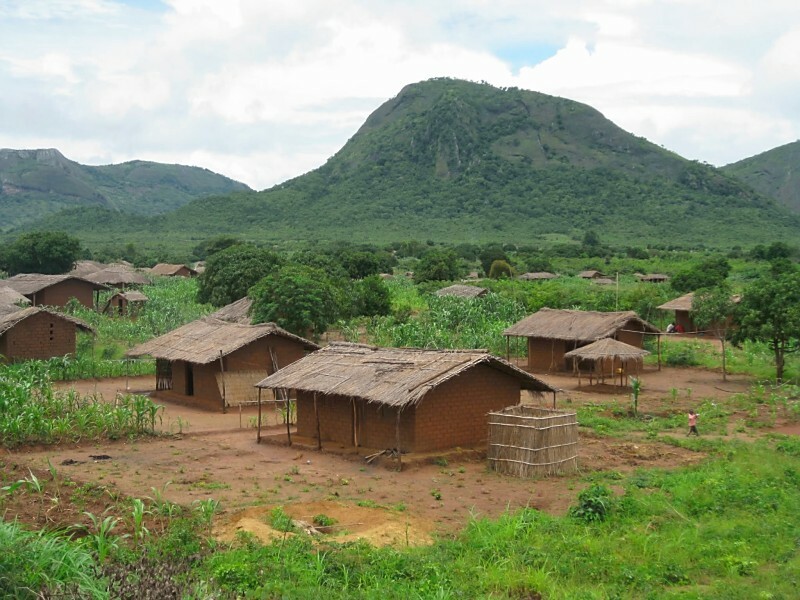 Walking into Malawi was a breath of fresh air. English signs, paved roads, and beautiful scenery welcomed us into the “Warm Heart of Africa”, as it’s called. Unfortunately, we were instantly ripped off by a pickup driver. But this one was at least honest and didn’t leave me angry like the bicycles. He basically said that in order for his pickup to go, we had to pay him 1000 Kwacha each for the 60km ride to Mangochi. This is probably triple what the locals pay. He knew the white people crossing the border would be forced to take his transport to get to the next city, and that he would be willing to wait all day until we agreed to his price. I said we would pay it as long as we could sit in the front, and immediately a bunch of locals hopped in the back and we were off. At least this one was an honest rip off. The ride to Mangochi was stunning. Kids ran alongside the car screaming “Muzungu!” (“White Person!”) as we passed through the highlands and eventually descended towards Lake Malawi. Also, since we paid such a high price for the ride, we were given great service by the driver–he even took us across the town of Mangochi and helped us find our next bus! By now it was past noon and we had 8 hours of travel behind us. But we were finally on the bus to Monkey Bay in beautiful Malawi! I should note that, while the situations described in this post were sometimes extremely frustrating and uncomfortable, we never actually felt threatened or in any real danger at any point. Most of the people we came across were very friendly ahnd helpful, and the journey went smoothly. You sound very tired. Or, rather, it makes me EXHAUSTED hearing about your many efforts to depart and arrive. I hope you both have some easier days ahead. Filled with beautiful sites and scrumptious curry! My, what a tale. A person couldn’t make this stuff up. RE: the “plauge of locusts”, how about “horde of the flies”?